With an orange alert for air pollution in place for the last two days, Beijing has new measures to deal with smog. 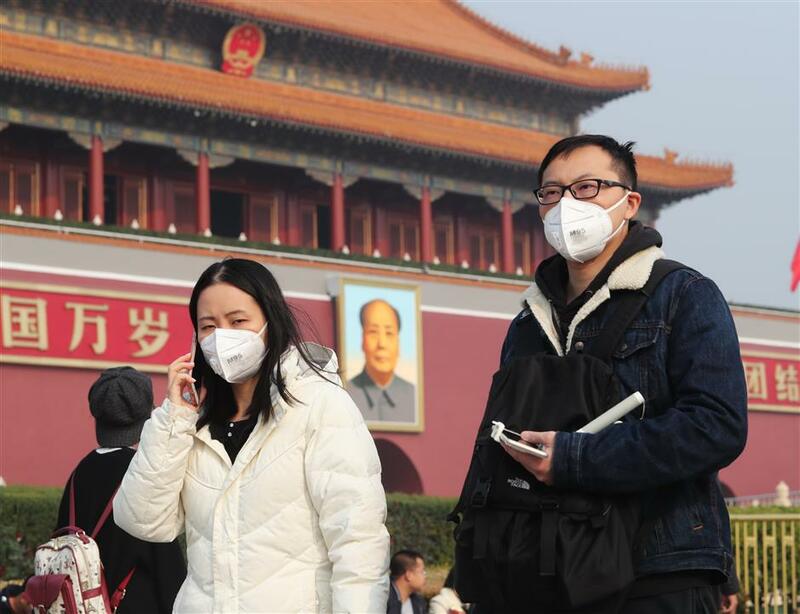 People use face masks at Tian’anmen Square in Beijing yesterday. An orange alert for the capital and its neighboring provinces have been raised since Saturday. It is the second highest in a four-tier alert system. The third and final phase of Beijing's southeast thermoelectric center in Chaoyang District has begun a one-week trial. The gas-fired power plant will go online before the heating period of the city starts next week, according to Beijing Municipal Development and Reform Commission and the Urban Management Commission. The center is the last of Beijing's four major gas-fired thermoelectric centers to come on stream, which together will cut the city's coal consumption by 9.2 million tonnes each year. Meanwhile, nine construction companies have been caught breaking dust control rules and have been suspended from bidding on projects in Beijing for the next 30 days. The Beijing Municipal Bureau of Environmental Protection said Monday that more than 3,000 trucks were caught illegally carrying construction materials and over 1,500 high-emission vehicles were prevented from entering the city Sunday. Inspections at 751 companies found 47 problems such as airborne dust at construction sites. The PM2.5 density stood at 158 micrograms per cubic meter at 10 a.m. Monday. Last week, the Ministry of Environmental Protection (MEP) forecast that Beijing, Tianjin, Hebei and their neighboring regions would see slight to severe air pollution from November 4-8. An orange alert, the second highest, was enacted Saturday in Beijing, Tianjin, and some cities in Henan, Hebei, Shandong and Shanxi provinces. Under the orange alert, the cities restrict the use of vehicles, increase pollution controls at construction sites, stop trucks transporting construction materials, and reduce or stop production at some companies. Beijing's average PM2.5 density dropped to 60 micrograms per cubic meter in the first three quarters of this year, down 3.2 percent compared with the same period last year, and down 34.8 percent compared with 2013. In the Beijing-Tianjin-Hebei region, measures such as replacing coal and penalizing polluters are being shown to be effective. In August, an action plan on air pollution in Beijing, Tianjin, Hebei and neighboring regions said that from October 2017 to March 2018, the average PM2.5 density in the area is expected to drop by over 15 percent.